To take sushi appreciation to the next level you have to see the movie Jiro Dreams of Sushi. In the film, chef Jiro Ono turns a restaurant consisting of 10 seats in a Tokyo subway station into one of the most renowned sushi establishments in the world. I dream of sushi, too, though more in terms of eating it than making it. Sushi has been in Japan since the eighth century but the current form as we all know and love it dates to just the last 200 years. Ironically developed as a fast food–rice and fish wrapped in seaweed was easy grab-and-go fare in Tokyo. This is easy to see here in Hawaii, where sushi variants Spam musubi and the ume rice ball are found at convenience stores and okazuyas, and you can even find sushi rolls at your supermarket deli section. But sometimes, sushi just needs to be part of a fine dining experience. For that, Miso Phat should spark your interest. 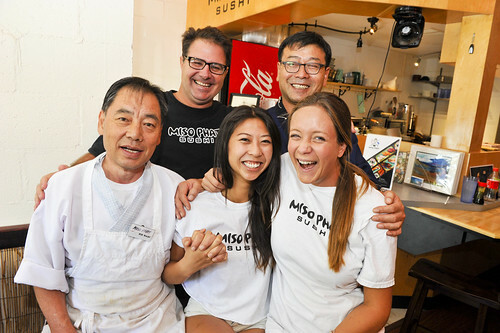 Miso Phat is not fast food sushi. Instead, they serve beautiful, locally caught fresh fish that’s artfully cut and rolled. They don’t have a lot of seats in their smart looking Kahana Manor dining room, but it feels very Tokyo inside with its white walls, wood accents, Chinese lanterns and lots of cold air conditioning. 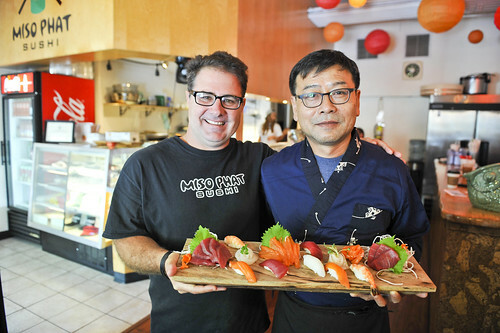 Restaurateur Shawn Steadman teamed up with sushi chef Ben Kim to open Miso Phat. This mom and pop spot does sit-down as well as take-out dining (it’s also BYOB). If you need a beer and sake with your sushi, stop by Tradewinds Kahana–one of my favorite liquor stores, conveniently located right next door. 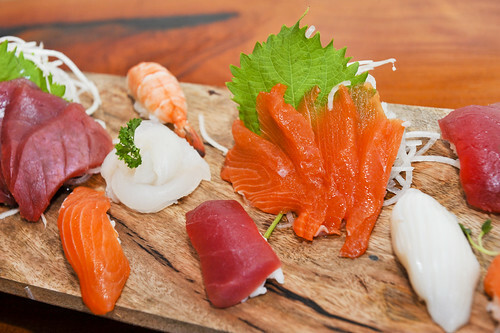 For many people, sashimi looks like a deceptively simple dish to prepare. Miso Phat makes clear that it’s anything but. It’s an art to deliver that spectacular shiny block of fish flesh to you, and Miso Phat’s presentation is wonderful: little wooden plates on stilts that make me think of geta, those traditional Japanese lifted shoes. 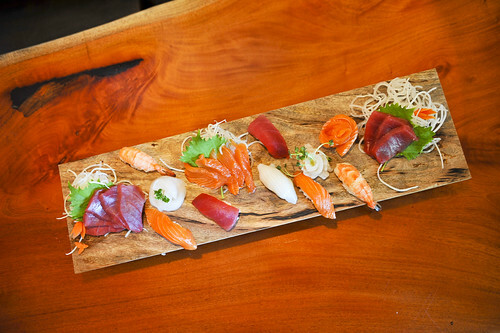 But a mixed sashimi platter is one thing to behold and quite another to consume. The fish should be cut against the grain and the ika should be tender. Vegetables add color, while pickling adds scent and flavor. I always order a sashimi platter so that I can really taste the fish and see the different colors and textures offered and how creative the sushi chef can get. The platter at Miso Phat was all that. There were big, meaty squares of ahi, slim and shiny white slivers of hamachi, bright orange marbled salmon and cucumber, lemon and shiso adorning my plate, along with the requisite dollops of wasabi and ginger. Next up I opted for the Spider Roll. I love soft shell crab, but it’s a risky thing to order. Sometimes it comes too soft–it should have a crisp exterior–while other times it can be very fishy tasting. But when it’s right, it’s game on, and Miso Phat had it right. Their Spider Roll was cool and crispy, rolled with cucumber, crab and tobiko and drizzled with unagi sauce. My daughter ordered the California roll, that sushi standard for kids and rookies, but even here they set the bar much higher. A plate of beautiful rice, nori, cucumber avo and crab flowered soon appeared before her. She was thrilled, and has been asking to eat at Miso Phat ever since. While I was gorging on my selections, a California couple came in and asked the chef to make rolls without rice–just veggies and fish. After a quick translation in Japanese from the server, the chef was off and running. wielding his knife along the cucumber to create a thin wrap for the spicy ahi, cucumber, avo and sprout roll he created. It was amazing, and the customers–clearly happy with the results–set about ordering different combinations of fish, shrimp and veggies in their rice-free rolls. 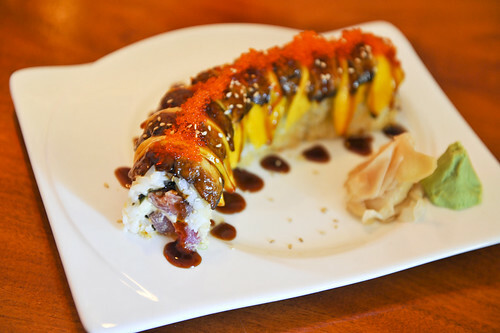 I can’t wait to head out to the upper Westside for another sushi at Miso Phat. 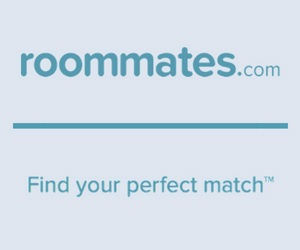 They start lunch at 11:30am and close around 9:30pm.